Analysis of acoustic emission signal evolutions for monitoring diamond-coated tool delamination wear in machining; High-performance machining of austenitic stainless steels; Forces monitoring in shape grinding of complex parts; Optimization of minimum quantity lubrication in grinding with CBN wheels; Electrical discharge machining: Study on machining characteristics of WC/Co composites; Conventional and unconventional hole making in metal matrix composites; A laboratory machine for micro electrochemical machining; Cam-driven electromagnetic mechanical testing machine. 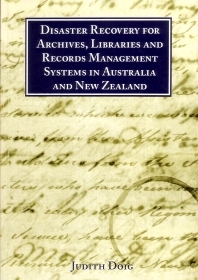 Floods, fires or earthquakes can cause critical damage to books and to records. A recovery effort which is well-intentioned but ill-informed or hasty may make the damage far worse. What should be done? What should not be done? This is the first book on disaster recovery specifically tailored for the Australasian market. The book discusses factors which should be considered by managers before setting up a disaster recovery plan, including prevention and insurance. It covers, in detail, the content and development of a disaster plan and considers training programs for those staff who are involved. There is an account of the history of disaster recovery with special attention given to disasters occurring in Australia and New Zealand and to the recovery efforts which have been mounted.